Why does the CHI Air Expert Flat Iron Work So Well When it comes to Straightening Curly Hair? Are you having a very hard time straightening your curly hair? Well if you are then you are not alone because curly hair is one of the hardest hair types to get to cooperate when trying to straighten it. One thing that you may want to consider is switching to another flat iron. Certain flat irons just tend to do a much better job at straightening curly hair than others do. One of them we have been hearing a lot about is the CHI Air Expert Classic Tourmaline Ceramic Flat Iron. That is why we thought we would take the opportunity to review one of the top rated flat irons for curly hair here. There is simply a lot to like about this flat iron. 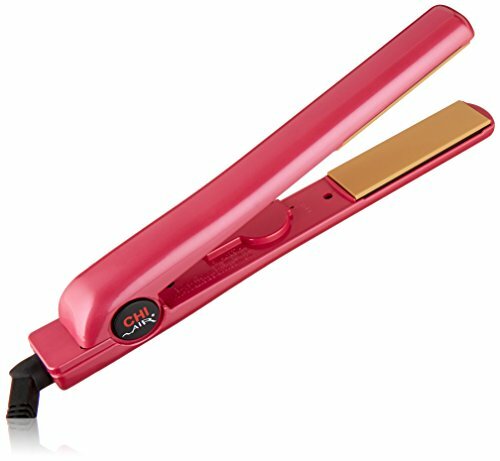 CHI is a popular choice in hair tools and products that work well like this straightening iron are the reason why. The nice features it has, start with its many different heat choices. With the dial-up temp selection, you can set your curly hair straightening temperature anywhere from 180°F – 410°F. 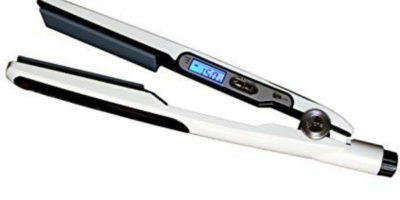 The CHI Air Expert Flat Iron also has ceramic coated and tourmaline infused 1” heat plates. This advanced heat plate design has several advantages. This flat iron tends to heat evenly and stay hot while using it, will reduce static electricity and frizz and add more shine to your curly hair as you straighten it. 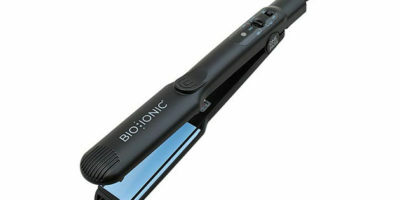 Another big bonus, this straightening iron gives you is its far infrared heat generation. It is gentler on your curly hair than other forms of heat because it heats your hair strands from the inside out. At a little over 1-pound, this flat iron from CHI is lightweight and easy to use. Arm fatigue should not be a problem even after long periods of use. It also has a rounded edge design that helps eliminate hair snags as you use it. There is no digital display but you do get a rheostat dial that offers you many temperature choices. It will automatically shut itself down after 1-hour of non-use and it comes with a generous size 9-feet long power cord with attached swivel end. Its dual voltage capability makes it a great travel companion when going overseas for business or pleasure too. Everything built into this CHI flat iron will combine to help you straighten your curly hair more efficiently and more effectively. If we had to choose the two main reasons it works well at straightening curly hair we would have to choose its floating plate design and its wide range of temperature settings. We all know that not all types of curly hair react the same way to temperature when they are being straightened. That is why having such a wide temperature selection choice is so important when straightening curly hair. The floating plate design is great because it allows your hair to stay in contact with the heated plates longer and makes each hair straightening pass you make much more effective. Despite how much we like the CHI Air Expert Flat Iron we did find a few drawbacks with it also. One of them is it sets heat by means of a rheostat dial. That means you never know what the exact working temperature of this flat iron is at because there is no incorporated digital readout. We also were slightly concerned that the body of this straightening iron gets a little warm the longer you use it. Improvements in the housing plastic could help eliminate this easily. It’s very hard not to like a flat iron that has many positive features and only a few minor drawbacks. That is why we give this flat iron a big thumb up after our review. It offers you a large number of working heat choices, has excellent ceramic/tourmaline heat plate technology and an advanced floating plate design. This flat iron is also dual voltage capable and its long power cord offers you almost complete freedom of movement while using it. It simply will work great straightening any type of curly hair that you have. Best Selling Flat Irons For Curly Hair!